Spring is here and that always makes me want to bake! The extra sunlight just makes me want to mix something sweet together pretty much everyday. Does anyone else feel this way or is it just me? 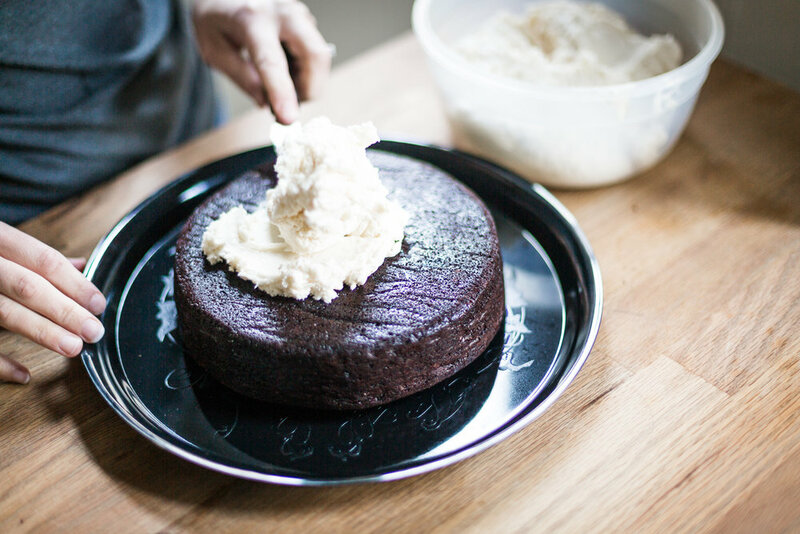 I've made this cake a few times and I love it every single time. It has a such a rich dreamy taste and texture. Using beer really works together with the chocolate to make a different kind of flavor. Now lets talk about the buttercream. 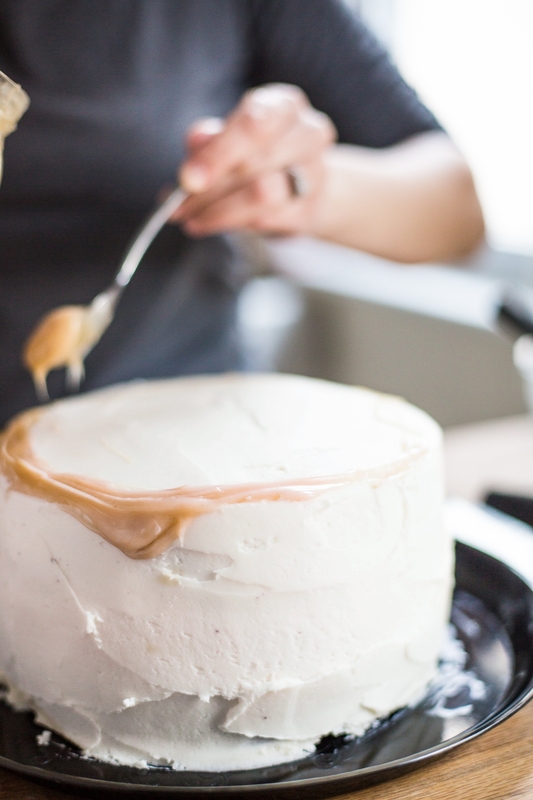 We take it to the next level by adding a salted caramel sauce to your average buttercream. It is out of this world. You can absolutely use the shortcut of a store bought sauce, like one you would put on your ice cream! But if you are feeling all sassy and bold I have included the recipe for a homemade caramel sauce. Don't be afraid- you can do it! This beer caramel cake is what my dreams are pretty much made of. Preheat oven to 350. Line two 9-inch pans with parchment, use baking spray on the entire pan and then dust with flour. In a large saucepan over medium heat bring the stout and butter to a simmer. (You may also use a microwave to melt the butter and then whisk the beer in) Remove the stout butter mix from the heat and add in the cocoa powder and whisk until smooth. Let cool for 5 minutes. While that is cooling, in a medium bowl whisk together flour, sugar, baking soda and salt together. In a separate large bowl, whisk together the sour cream and eggs. Add the stout mixture to the egg mixture and whisk to combine. Then add in the flour mix and combine with a rubber spatula until all the ingredients are incorporated and the batter is smooth. Be sure to scape the bottom of the bowl to get any of the dry flour bits! In a stand mixed with the paddle attachment, combine butter, 3 cups of the confectioners sugar, the caramel sauce and heavy cream on low until just incorporated. The turn up to medium and beat until it is creamy, about 1 minute. Scrape down the sides of the bowl. Add more of the confectioners sugar, 1 cup at a time and beating for 1 minute after each addition. You may not need to add all of the 7 cups of sugar. Now add in the cream cheese and beat on medium high for 1 minute. Using a rubber spatula scrape down the sides of the bowl to incorporate any remaining cream cheese. If this now seems too thick add heavy cream, 1 tablespoon at a time. 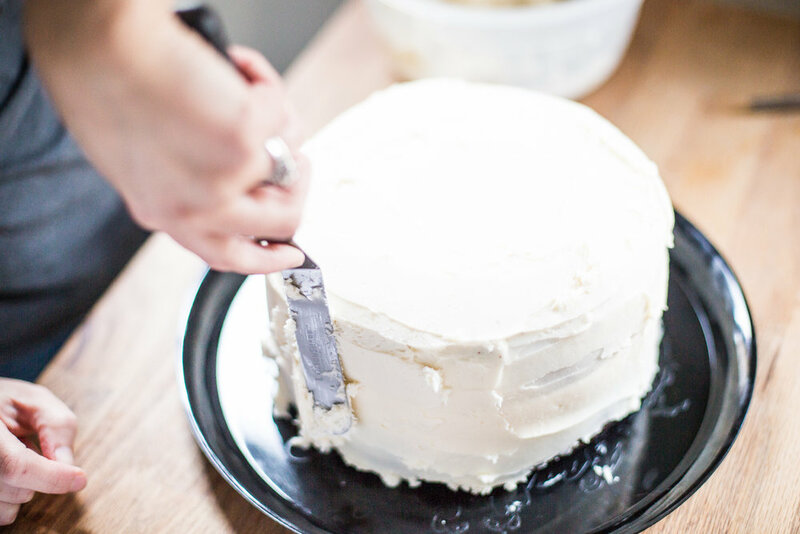 To frost the cake: Flip one of the cooled rounds on its top of a large plate so the flat side is facing up. Dollop a good amount of the buttercream into the middle and frost outwards until it is evenly thick. If you'd like drizzle a couple tablespoons of the caramel sauce on before placing the second cake round on top (again having the bottom face up to you). Now starting with the top evening work your way out and then cover the sides. I used the extra caramel to drizzle on the sides of the cake as well. Top with sprinkles! If you are feeling extra fancy then go ahead and make this caramel sauce! It's great on ice cream of maybe even a drizzle in your coffee. I always find making this so satisfying. Mixing them all together is like making a magic potion. A sweet sweet amazing potion. Try it!! Bring 1/2 cup of the heavy cream, sugars, butter, corn syrup and salt to a boil in an uncovered medium heavy-bottoms saucepan over a medium-high heat. Once the sugars have dissolved, whisk a couple times to combine. Continue to boil the mix over medium-high heat, whisking occasionally and keeping an eye one it. Keep cooking until deep dark tan bubbles form and it becomes paste like. 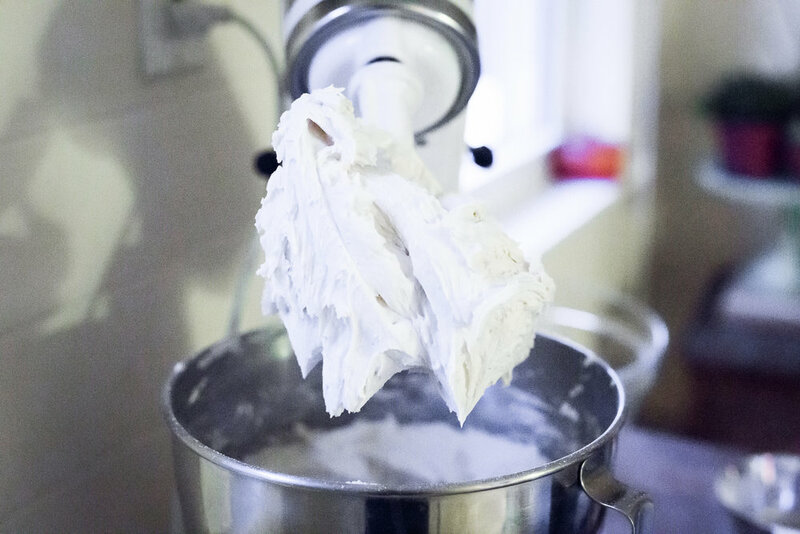 Pour in the remaining 1/2 cup of cream and add the vanilla, whisk together. Be careful at this point because the cream can splash and bubble up. Return the pot to low heat and bring it to a low boil, whisking quickly till the caramel is smooth, about 45 seconds. 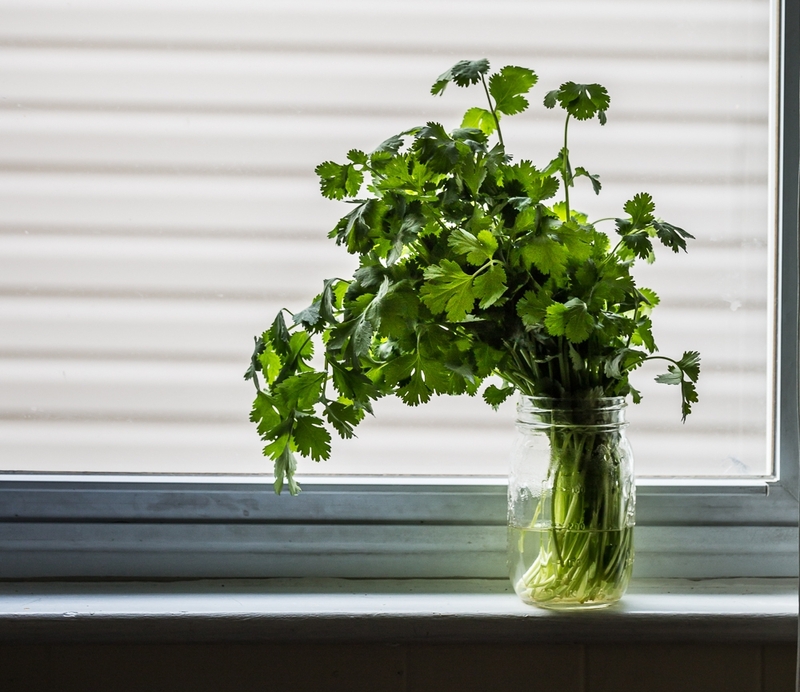 Turn off the heat and immediately pour into a heatproof bowl or jar and let it cool completely. Once cooled it is ready! Here are some tacos! Conor and I have made these babies 3 or 4 times now they're SO good. Perfect combo of crunchy and buttery. Smoky, spicy and also incredibly easy! Also they are fairly healthy to help align with any new goals or, perhaps resolutions anyone may currently have ;) Recipe adapted from here! 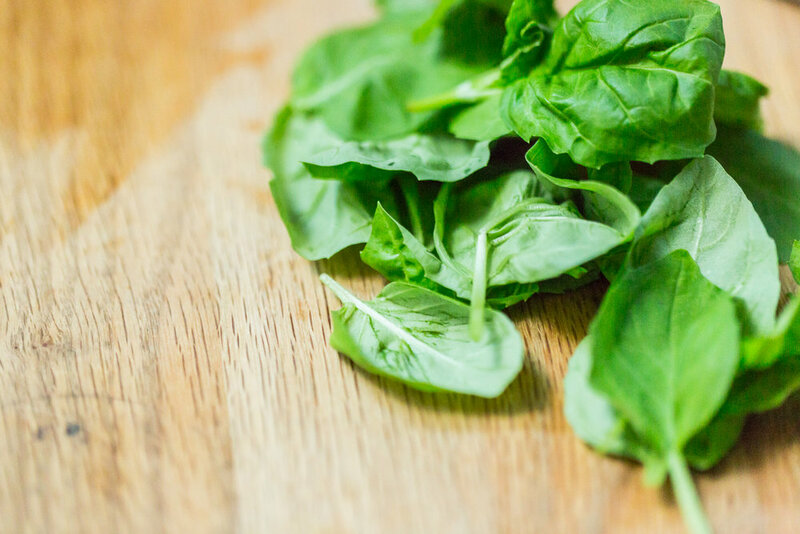 Place the sliced leaves in a large bowl. Add in the olive oil, adobo sauce and chili powder. 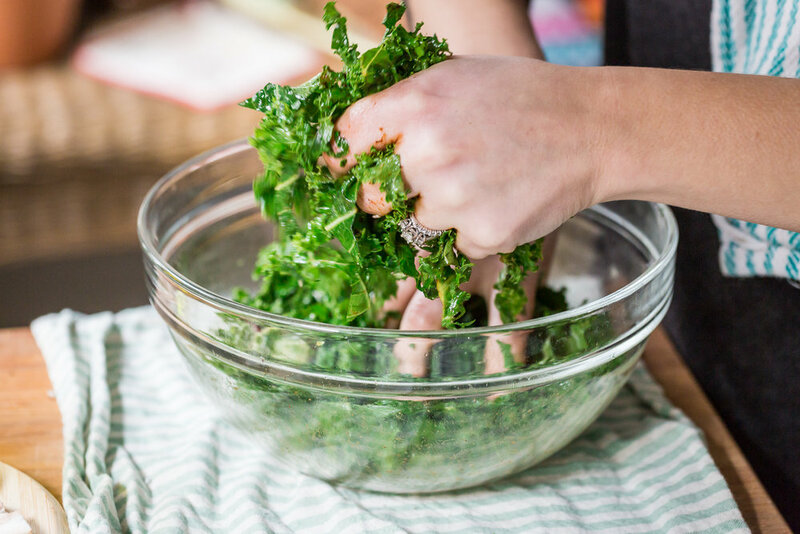 Using your hands evenly mix and massage the ingredients into the kale making sure it is evenly coated. Set aside. Be sure to wash your hands after this step! In a large skillet over medium heat add a splash of olive oil and the butter and let melt. Add in mushrooms and let cook till they are soft, about 8 minutes. Stir in garlic, cumin, salt, pepper and cilantro. Turn off the heat. Assemble the tacos! 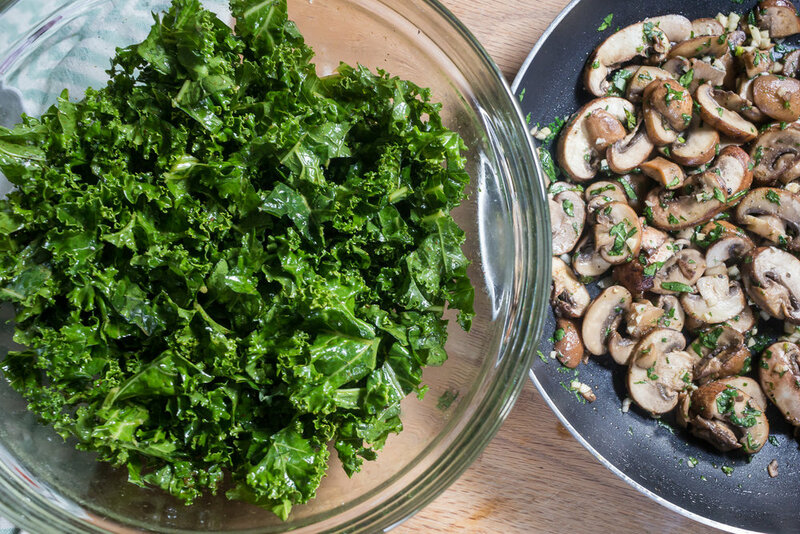 Start with some kale, a scoop of the mushrooms and then your desired toppings. Enjoy!! This soup is such a treat. Classic tomato soup + grilled cheese kicked up a couple notches. 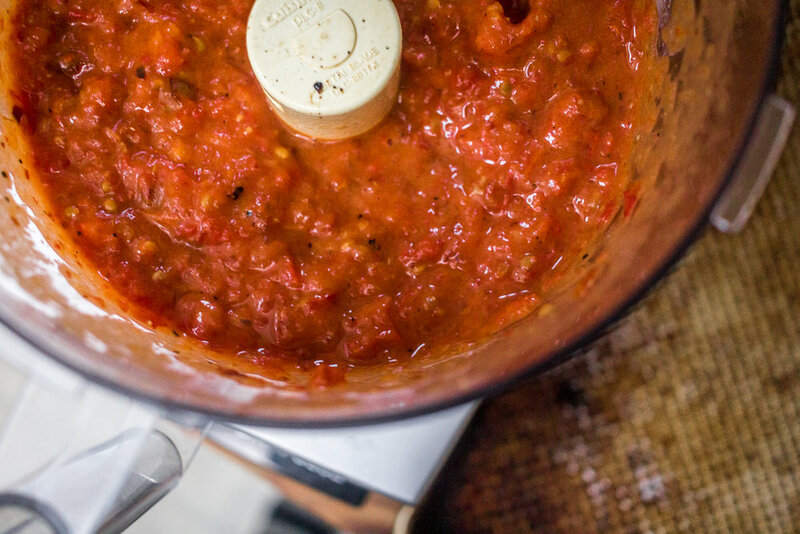 Although tomatoes obviously aren't in season right now, by roasting the plain ol' plum tomato you get a delicious, rich base for this soup. As for the cheddar lid that you put on top, I think it speaks for itself! Remove garlic from the tin foil and peel or squeeze out the cloves. 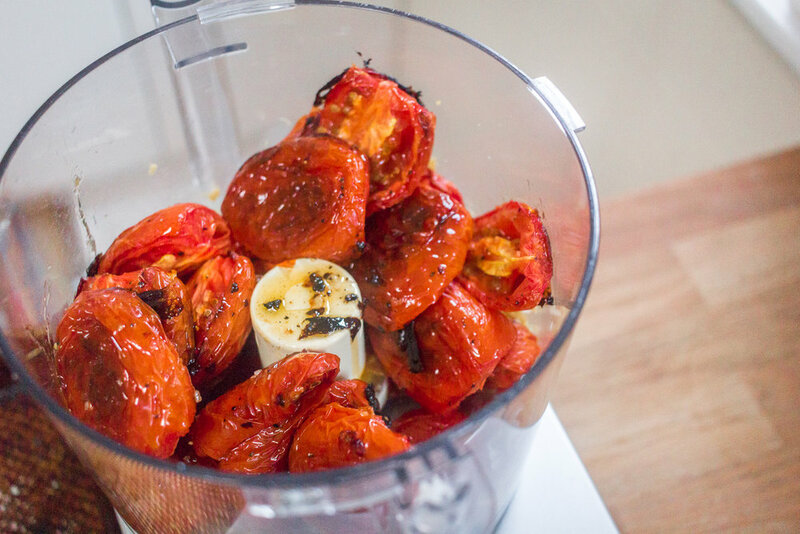 Put that garlic along with tomatoes and and juices from the sheet pan into a food processor, or blender. Pulse until it resembles a chunky puree. Take the tomato mixture to a medium pot and add the basil, crushed red pepper and stock. Bring up to a boil and then turn down to a simmer, uncovered for 20-25 minutes. Add salt and pepper if needed. Ladle the soup into an oven safe bowl or mug and grate a little of the onion into each bowl. Lower oven to 350. Line a baking sheet with parchment or tin foil. 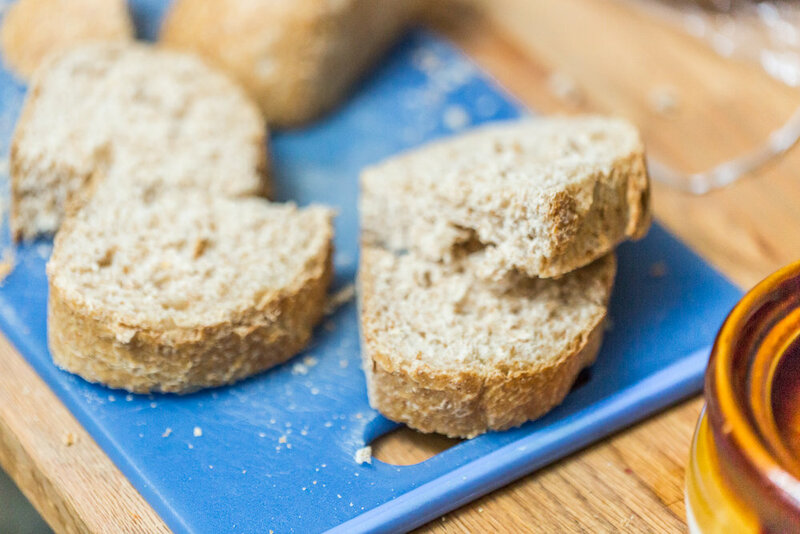 Slice your bread to fit the top of your bowl and place bread on top. 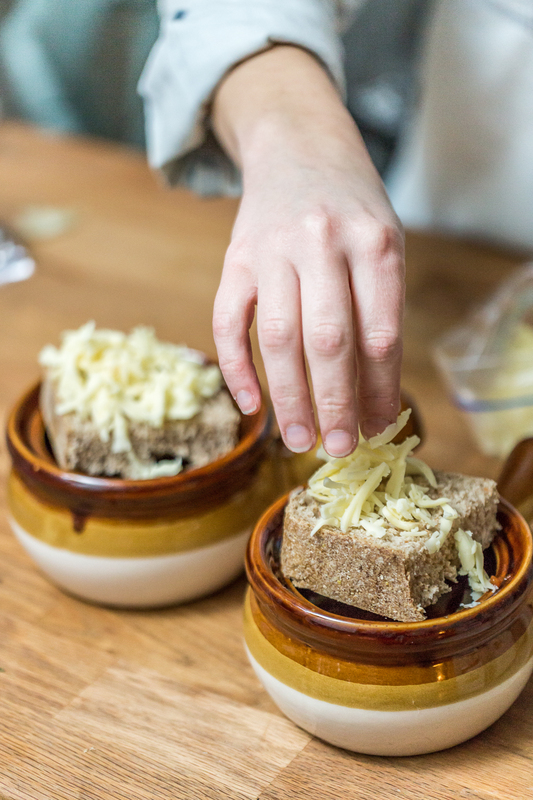 Now sprinkle the cheese evenly on top between all mugs. Place on baking sheet and cook for 15-20 minutes or till the cheese is melted and bubbly.